Hospital staff at the University Clinic Center of Kosovo open a shipment of supplies that will help mothers and babies. Over $150,000 worth of supplies, including basic antibiotics, were included in the shipment. 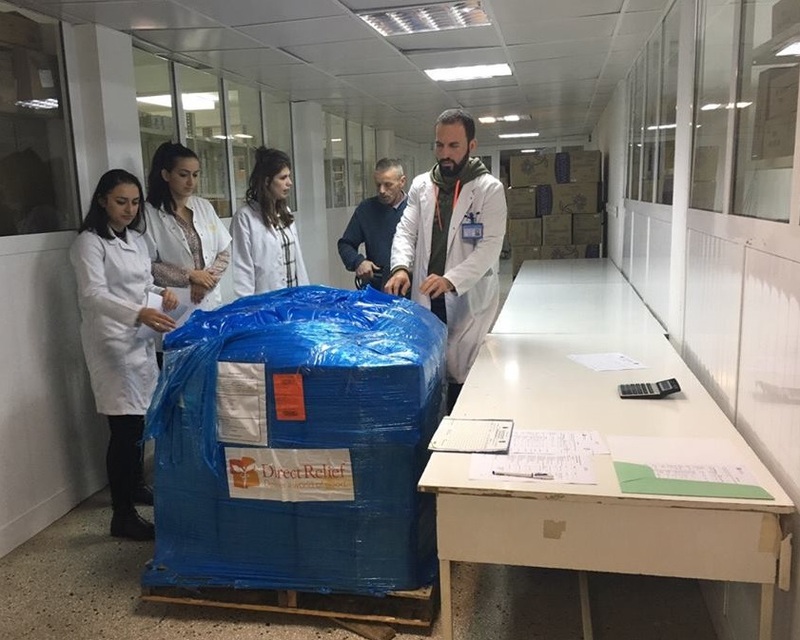 Direct Relief recently delivered its first-ever shipment of medical resources to Kosovo, providing more than $150,000 worth of medications to the University Clinic Center of Kosovo to support the hospital’s obstetrics and gynecology department. “We hope this will be the first of more donations,” said Albiona Beha of Action for Mothers and Children, a nonprofit organization coordinating the delivery of the shipment to the hospital. “The help that is coming from Action for Mothers and Children is to be appreciated and we are very grateful to the foundation and all its partners,” said Dr. Myrvete Pacarada, Director of the UCCK Gynecology and Neonatology Clinic. Earlier in 2016, Direct Relief learned about AMC’s work in the region, which focuses on reducing infant mortality as well as improving the health of mothers and children. After the war in that country, Kosovo suffered some of Europe’s highest infant mortality rates, and over the past decade, Action for Mothers and Children has been working to reduce those numbers. A partnership between Direct Relief with the group was forged earlier this year, and a shipment was sent to AMC filled with prescription medications, antibiotics and other critical medications. The shipment left on Oct. 18 and arrived one week later in Kosovo. Direct Relief Program Manager Joe Harrison visited with AMC officials in Pristina, Kosovo, earlier in 2016. He also met with ministry of health officials from Macedonia, Albania and Kosovo, and expressed optimism about expanding Direct Relief’s work in the Balkans. Publicly-run health departments, as well as charities and private organizations, are working to strengthen healthcare systems in the region, he said. “They are taking strides to rebuild since the war, and they have made tremendous progress,” Harrison said. On a regional level, Direct Relief has partnerships with the Ministry of Health in Skopje, Macedonia, and has sent small shipments to Greece to the south and to Bosnia and Herzegovina. Direct Relief sent 10 pallets of supplies to Macedonia earlier in November, and more shipments are forthcoming as new partners make more requests of the organization.